Nathan Hill tests this rather smart-looking new external filter from JBL. JBL always seems to be the 'other' choice of UK hardware and this is a shame as so much is of such a high standard. Users of JBL’s CO2 kits will know that the brand produces some pretty reliable gear and its canister filters are one of those understated lines. The e700 filter is named after its flow – 700 l./154 gal. per hour. 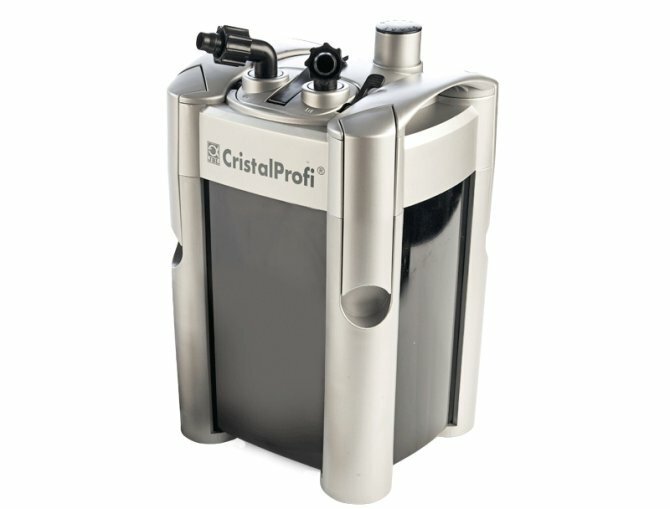 This gives it a claimed compatibility with tanks between 60 and 160 l./13 and 35 gal.) volume, but a heavily or even medium stocked 160 l. aquarium would be asking a lot of this filter, I suspect. I’d be happier seeing it used up to a sensibly filled 100 l/22 gal, but that’s just a personal reservation as I tend to prefer overkill when it comes to filtration. So much so that in testing this unit, I’ve personally chosen to run it on an aquascape that barely holds more than 17 l/3.7 gal. It required some ingenuity of flow outlets and tweaking to make it compatible. The kit is smart and would be the obvious choice for those who don’t have the luxury of being able to hide their filters in cabinets. For those who do want to hide theirs, you get a good 1.5m/5’ of hosing for both inlet and outlet, so you can position it further away if needed. Strainer outlets and spray bar return are included as standard, along with various clips and suckers — but, as an aside, the 12mm/ 0.5” hosing used also lends itself nicely to some other brands of glassware. The filter body feels flimsy, almost 'plasticky' when you hold it for the first time, but it soon becomes obvious that the casing is as sturdy as it needs to be. The finish is also easy to clean, with only some very limited points that might ever risk corrosion. For those concerned about longevity of metal, a tiny dab of silicon over exposed screw heads would help to put minds at ease. Getting the head off is easy, but reaching the impeller requires removing an odd, flat panel not found on other canister filters. Once you get your head around this task, it’s pretty easy from there. My impeller is literally sloppy with silicone lubricant and I’d recommend having a quick look to check that a new model isn’t excessively coated in it. Media is included, mainly in the form of foams, and a huge amount of ceramic prefilter is sat at the base. The foam designs are such that you can pull out the centre of some mechanical media and replace with a filter of choice. I’d opt for a biological layer, as this appears to be lacking as standard. As is the norm these days, there’s a quick-release mechanism at the tap assembly on the head. Both inlet and outlet pipes can be rotated in a 360° axis, which is something most filters don’t have — a nice touch. A primer pump is also included, but again this is nothing too unusual these days. The difference for JBL is that theirs actually works, and works well with the inclusion of some simple non-return devices inside the head of the unit. Within just a couple of pumps of the primer, the filter is happily siphoning away, guzzling down tankwater like a dehydrated elephant. The only parts I’m really wary of are the connecting handles that hold body to pump. Given the brittle nature of the plastic holding everything together here, any rash or overly aggressive move could result in a costly and unfixable mistake. In all, this is a good filter that’s a little too refined for heavy-handed abuse, but worth a peek for someone trying to keep their set-up looking smart.